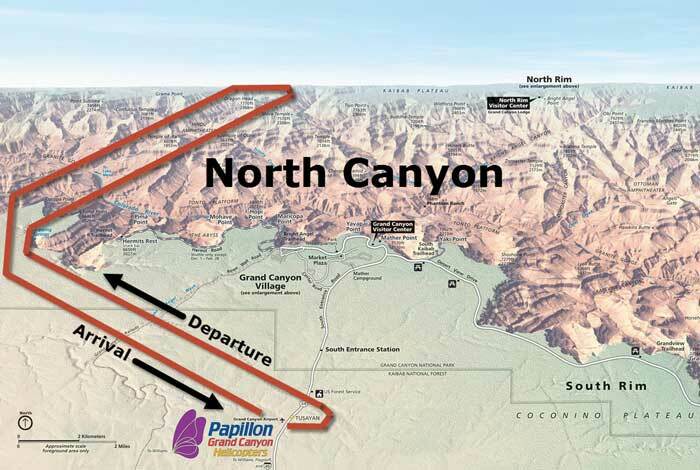 The North Canyon Tour departs from the Grand Canyon National Park Airport at the South Rim. This Helicopter Tour will take you over to the North Rim and back. Departs from the Grand Canyon National Park Airport, Papillon Terminal – Please arrive 30 minutes prior to your tour time for check-in and orientation. The North Canyon Helicopter Tour is flown in a Bell Helicopter. (The Bell Helicopter has been the industry standard for helicopter tours for many years. Departure: Board a helicopter and depart the terminal for amazing views of the Grand Canyon National Park. Helicopter Views: Enjoy this narrated tour over the North and South Rims and see Dragon Corridor – the most photographed region. Look down at the Colorado River nearly one mile below. Return: Return to the terminal after witnessing Grand Canyon National Park from above and capturing the incredible scenery.